An historic landmark built in 1921, Bovard Administration Building stands tall. The USC University Park Campus proudly preserves the older architectural sites, while continuing to build newer more modern structures. Photo by Gus Ruelas. 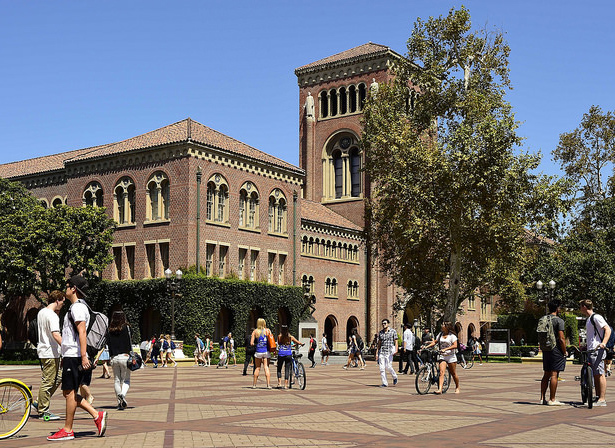 The University of Southern California offers a tremendous range of academic and intellectual opportunities, and this catalogue should serve as your roadmap. In it you will find information on classes offered by our Dornsife College of Letters, Arts and Sciences, the Graduate School and 18 different professional schools. I hope you will feel inspired to consider innovative and creative ways of pursuing your education. To our undergraduates: You are fortunate to have advisers and professors who wholeheartedly encourage you to explore different disciplines and departments. These years should be a time of discovery, for stretching yourself intellectually, creatively and socially. One of USC's distinctive traits is its emphasis at the baccalaureate level on what we call "depth with breadth" — that is, promoting the creative combination of majors (or majors and minors) that seem far apart in the intellectual landscape. USC offers more than 170 minors, and we encourage you to examine those that challenge you, perhaps taking your studies in an entirely new direction. To our graduate students: Your courses — though designed to focus rigorously on various specialties — are intended to deepen and expand your knowledge. We urge you to pursue interdisciplinary connections and to build relationships with your peers in other fields. These relationships will enrich your work, and increase the tremendously vibrant academic culture on our campuses. Intellectual breadth and agility are the tools you will need to succeed professionally, and the education you receive at USC will certainly equip you well. Be bold in designing your USC education — and in creating your future!